In case you haven’t heard of it yet, Perpetuum will take a little break tomorrow. The reason is that the datacenter where our servers are located is moving to a bigger location (still in Budapest), so we will have to physically move our servers as well. Since we are operating everything from there, this means that not only the game server, but the website and all connected services will be also unavailable for that time. To avoid confusion: this is not the server move that we plan to make some time in the future to address routing issues, this is simply a necessity. The servers will go down tomorrow (2011-09-13) morning at 7:00 CEST and will be probably offline for the better part of the day. It’s hard to make any predictions on when we’ll return, but we’ll keep you updated via our facebook page during the downtime. We will of course compensate the lost game time to all of you by extending account expiry times accordingly. Apart from sporting our first high-detail robot models that our artists have been working on for a while now, you’ll also find some structural changes. If you ever wanted to have all the news at a glance, the main starting page will become your best friend from now on. 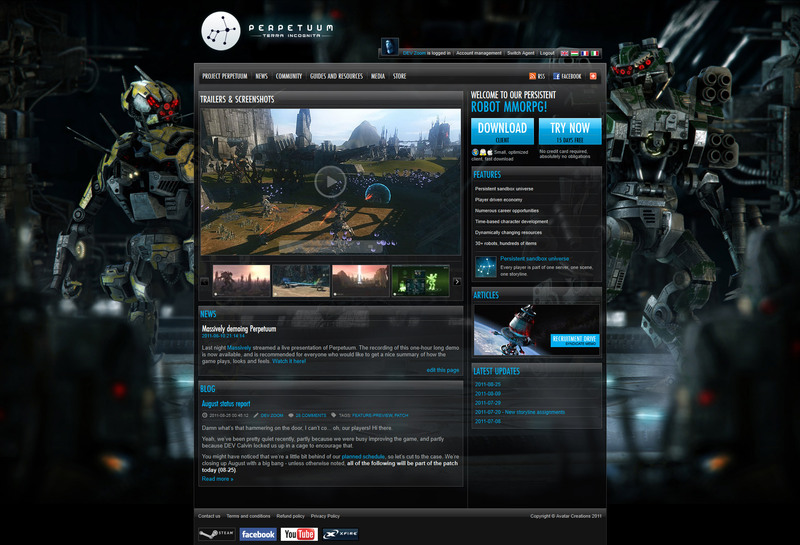 The latest news, blog posts, patch notes and all that will be part of the new front page. We have also simplified the main menu and rearranged some links into more logical categories. A brand new section will also see the light, an ever-expanding collection of articles about the world of Perpetuum: gripping short stories, insights on some of the more intriguing parts of the lore, or official Syndicate-memos for those who are into more serious role-playing. The blog and the forum will also be more tightly integrated into the whole design, so we hope this will make navigating our pages much more comfortable. So that’s all for now, tell us what you think about the new website when it goes live tomorrow evening! Looking forward to more of the rold-playing immersion! These new robot models making their way into the game, or are they just for the website? I'm sure we'll eventually make use of them in the game too, like for normalmaps. "So that’s all for now, tell us what you think about the new website when it goes live tomorrow evening!" Fine I has only one thing the picture what after to robots is a little confused the robots and I think you can find a better picture for that or just one colour than before. Looks good. Does the move mean a better net connection? Good stuff. Gives us high poly high res roboootssss. And no, it's more likely this move means fresh minty arctic airflow cooling the servers. I approve of the shiny new website. Love it :) Good job, guys. Thanks for the revamp and the stories! This is amazing - both the new website and the new robot models! Good work!